A composer largely ignored today it is hard to imagine that at one time Max Reger was the most performed composer in Germany, second only to Richard Strauss. Over a relatively short life Reger wrote a substantial quantity of music numbering over a thousand scores in virtually all genres apart from opera. Though concentrating principally on keyboard and the smaller scale Reger successfully wrote a number of larger orchestral and choral works. From 1900 come the pair of Romances. No. 1 is dedicated to Eugen Spitzweg of the publishing firm Aibl and the No. 2 to the physician Dr. Bertold Rebnitzer. Both scores were published in Munich by Joseph Aibl in 1901. Reger found a precedent for this enterprise in the Beethoven Romances: opp. 40 and 50. In addition Reger would have surely known Dvorák’s F minor Romance (1873-77); Bruch’s Romance in A minor (c. 1874) and Svendsen’s G major Romance, op. 26 (1881). Marked Andante sostenuto Reger’s solo violin in the first Romance inhabits the higher registers for much of the time. Warm and summery though often moody this pleasantly appealing piece contains little in the way of excitement with only limited aspiration to variety. Rather more serious than its G major twin the second Romance is a score suffused with melancholy. In this Larghetto Reger could easily be reflecting an intense longing after parting from a loved one. All that said this score is unadventurous both melodically and in terms of character. 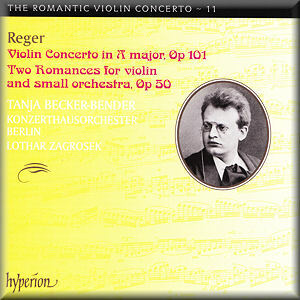 Reger’s Violin Concerto in A major, op. 101 was composed in 1907/08 around the same time as one of his most frequently heard scores, the Hiller Variations. It was premièred in 1908 by its dedicatee Henri Marteau with the Leipzig Gewandhaus Orchestra under Arthur Nikisch at Leipzig. At almost an hour long this score is virtually never programmed in concert programmes. I was reminded of the fate of two other violin concertos also conceived on a grand scale that I admire and haven’t managed to establish any grip in the concert hall namely: Joachim’s Violin Concerto No. 2 in D Minor ‘In the Hungarian Style’, Op.11 (1860) and Stanford’s Violin Concerto in D major, op.74 (1899). In these times of austerity where maximising audience numbers is of principal concern it would take a brave orchestra to programme the Reger, Joachim or Stanford ahead of the crowd-pleasing staples. The massive three movement score commences with an Allegro moderato lasting almost twenty-eight minutes. Mainly reflective, slightly temperamental and very occasionally stormy the movement although attractive feels much too long for its material and fails to hold the attention. The general calm of the central Largo conveys an undercurrent of melancholy and feels samey and unmemorable. The relatively upbeat Finale marked Allegro moderato (ma con spirito) contains an interesting yet moderate range of ideas. That said, they lack coherence and tend to drift around looking for direction. The Reger critic that wrote, “he stifles music with too many notes” could easily have been referring to this movement or any of the other two for that matter. My Reger work-list shows that there is also another work for violin and orchestra - the Andante und Rondo Capriccioso from 1916 - but I understand that the score remains incomplete. There is a widely held critical opinion that Reger’s music uses only limited resources of harmony and rhythm, is challengingly complex and too densely scored. It would be hard to label these particular violin works as being too complex, however. Despite the number of ideas these scores do tend to lack variety and contrast. The melodies although often attractive are barely memorable and the music soon becomes wearisome. Nevertheless it was good to have the opportunity to hear this new recording and the performances do get the finest possible advocacy. The Stuttgart born violinist Tanja Becker-Bender seems eminently suited to late-romantic scores such as these. In profoundly expressive performances she produces a most attractive sound with immaculate intonation. Her polished and compelling artistry never feels self-indulgent or wayward. Lothar Zagrosek draws splendid accompaniment from his Konzerthausorchester providing nicely judged weight of sound and tempi. An orchestra overshadowed by their illustrious neighbour the Berlin Philharmonic I have attended three Berlin concerts by the Konzerthausorchester and have been highly impressed by their playing. Perhaps the best known account of Reger’s Violin Concerto in A major is beautifully played by Manfred Scherzer and the Staatskapelle Dresden under Herbert Blomstedt on Berlin Classics 0091242BC but this Hyperion release is exceptionally well recorded. Rather than use the Berlin Konzerthaus - the neo-classical masterpiece that is the home of the Konzerthausorchester - the engineers have chosen the Jesus Christ Church at Berlin Dahlem. A building renowned for its wonderful acoustics Sir John Barbirolli and the Berlin Philharmonic were recording Mahler in the Jesus Christ Church back in 1964. It is still highly popular as a recording venue today as I witnessed last September when I visited the church and failed to gain access to the building because? Yes, a recording session was in progress. As usual Hyperion has provided warm, clear and well balanced sound.